Life as an Arsenal fan, eh? Before the game we had excitement. The team was left of field as Unai has done to us all season; it was exciting and with Mavropanos in, a midfield including Xhaka and Torreira, with Ramsey providing energy in front of them, this felt perfect for a Watford side who we knew are in form, would come at us hard and make us work for our point or three. If we were lucky enough to get that. Unai also threw us a back four shaped curveball which had Mustafi at right back, a brand new centre half pairing and Monreal at left back, which was a little uneasy but in the main I kind of felt ok with. Monreal looks like he’s starting to play as if he’s reaching the autumn of his career and yesterday evening it felt like he could be exposed if Watford play the flanks. Thankfully that’s not the type of side they are, but we still knew we just needed to ride out the opening exchanges and maybe, just maybe, this away day hoodoo could be expunged. And the game started just as many of us probably predicted. Watford pressed high, they were physical, they wanted a battle and their fans were in decent voice knowing they have an FA Cup final on the horizon. Even after the Deeney incident – which I’ll come to in a bit – it felt as though they were always planning on rattling Arsenal and little scummers like Hughes always fancy leaving a foot in on a player if they get the chance. I’ll be honest; I thought it would be a long night until Ben Foster sorted us right out. 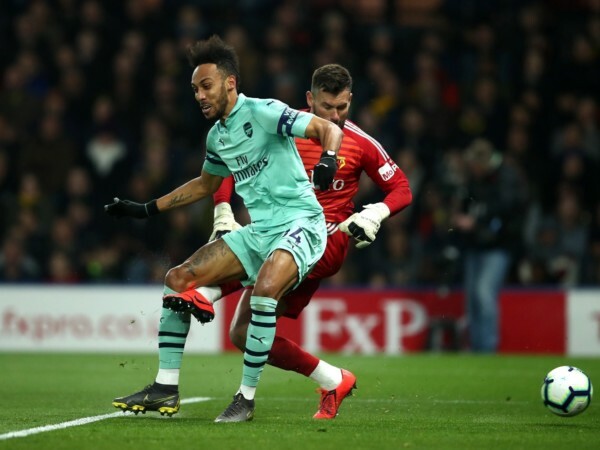 His dwelling on the ball afforded Aubameyang that extra second to close down and in a goal that you’d expect from Lacazette more than his Gabon mate, he got there in time to give the Watford ‘keeper some blushes. Aubameyang is a predator and Foster should have known better, but that goal felt like it was an important one for Auba because for the rest of the night he didn’t exactly look at his predatory best. But even at 1-0 you, like me, must have known that we were going to be in for a long night because Watford would come at us and come at us hard. It’s that kind of comment that makes me second guess whether actually all he was trying to do was test an Arsenal player by ‘leaving a bit’ on him and if that is the case then he got his just desserts for walking the fine line between psychological advantage and breaking the laws of the game. Not that it changed the complexion of the match though. Watford still pressed us hard, they still won more 50/50s than us and even at half time I couldn’t believe that we were up by a man. We looked jaded, leggy, our passing was a little off and given the advantage we never really looked comfortable in taking hold of the game. Some of it was due to our players – like Mkhitaryan who absolutely stunk the place out and I was stunned that he wasn’t hooked at all – but also I have to give credit to Watford. They are a very organised team. Gracia had them breaking hard and fast when the ball turned over, he pressed three players high when Leno took goal kicks, but also tucked in when we had possession. It completely stunted our ability to find space and as a result made the entire match uncomfortable for those Arsenal players. But it shouldn’t have. They are all good enough to find space and make space but maybe the psychological issues away from home played a part, because at times we were erratic and didn’t control the football. We just didn’t work it around the pitch quickly enough and the result was an ugly Arsenal performance. But ugly is fine if you get the points. We did. These are precious at this time of the season and so ultimately who gives a friar if we are so unconvincing. Dave and I spoke after halftime about how we think Arsenal probably need four wins to secure top four. We have one. We need two at home against Palace and Brighton, then find one win out of Leicester, Wolves and Burnley. I’d like to think we could pull one out of the bag so as it stands it feels like we’re in a good place for top four. Onwards we go. Next up? The small matter of an away trip to Napoli. Hope you have enough fingernails prepped for what will surely be a tough night.